West from Washington to Montana, South to California and North to Alaska. Along stream in lowlands to lower mountain valleys. Rocky streams and river edges to moist alluvial terraces. Fine textured soils with moderate to high amounts of water. 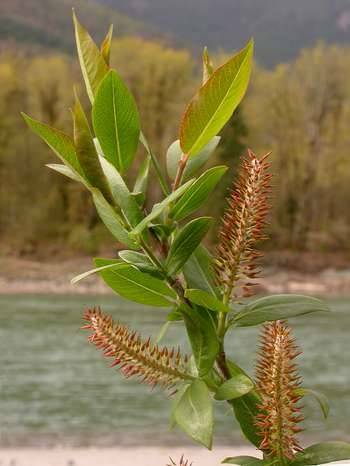 Early pioneer, often replaces coyote willow (Salix exigua). Widely scattered overstory of black cottonwood (Populus trichocarpa), or water birch (Betula occidentalis). Coyote, Drummon and whiplash willows are also common (S. exigua, drummondiana, and lasiandra). Also redosier dogwood (cornus stolonifera), ood's Rose (Rosa woodsii) and inland gooseberry (Ribes setosum). May be propagated as seeds or by cuttings. cuttings can be propagated easily without the use of rooting hormone. Seeds do not exhibit any sort of dormancy. Should be planted immediately for best germination rates, or refrigerated in a sealed container for up to a month. Seeds should be used to grow container plants. Cuttings may be planted directly at site or grown in greenhouse. Willow should be established in capillary zone with barriers to prevent rodent or beaver activity. 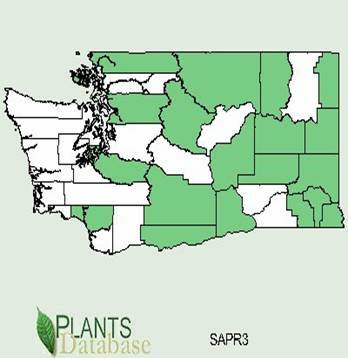 The plant is adapted to a wide variety of soils from coarse textured soils to silt loams. Most successful when greenhouse grown (80% cutting success), especially for seeds. Seeds should be immediately planted for highest germination rates. Shrub grows from 6 to 30 feet tall. Relatively long lived.